Take a deep breath, and try to stay calm! When you think you have locked your keys in the car, panic often takes over and all reason is thrown to the wayside. Sometimes, you are not actually locked out. There may be an open passenger door or a way to enter through your trunk or hatchback. If you have checked all of your options for entry, and you are sure you are locked out, look around for tools that you might be able to use to get inside. Gone are the days, on most recent model cars, of picking up a wire or coat hanger and pulling the locking knob up. If you have a post lock and are wearing shoelaces, you might have enough of a tool to get the job done. Coat hangers and shoelaces work in much the same way. The basic idea is to get a loop-ended straight object through the window seal and the window and into position to lift the lock button. For sliding or push locks, a coat hanger that is straightened may be maneuvered to push the lock open as well. Sometimes a screwdriver as a makeshift wedge can be used. WARNING: These tried and true sliding or push locks methods often leave damage to your car. Air or rubber wedges are used to create a gap where you can insert the necessary tool to lift a lock. If you do not find an actual car wedge, a rubber door stop, or even a screwdriver may do the trick. A probe works much like the coat hanger. It is basically a long, sturdy thin object with a loop on the end that can be inserted and positioned to lift a push button lock. The slim Jim method is similar to the coat hanger, wedge and probe method. The difference is that the slim Jim fits into your door and is designed for this purpose. Be very careful, because there are now many wires and electronic components that are inside door panels that you could damage in an attempt to open your door. If your vehicle was manufactured before the mid-1990’s, it probably has traditional locking mechanisms that consist of inside wafers and pins that can sometimes be jiggled into position to open. Use a professional lock-picking tool, or something like a paperclip sometimes works. WARNING: An attempt at picking a lock may result in a damaged lock that is not covered by insurance. To complicate a typical “locked my keys in the car” situation, sometimes your keys may be trapped inside a locked trunk. If this is the case, the best help some services can offer is to drill open your trunk lock, which leaves you with a hole in your car that isn’t covered by insurance. Unless you have the proper tools or are extremely skilled at unlocking your vehicle with these or similar tools, there is a great chance you will damage your car in an attempt to get inside. 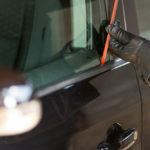 It is time to call someone who is equipped with the proper tools and knows how to properly use them to open your doors without leaving any damage to your car. If you are a member of AAA, unlocking your vehicle may be part of your coverage plan. Otherwise, some On star services provide remote unlocking services. If your service agreement has run out, or if a car lockout is not part of your policy, these services will assess a fee that you may not be prepared to pay. Some police officers are equipped for lockout situations, but some municipalities allow an officer to open your vehicle only if it is an emergency, such as a child trapped inside with the engine running. A local mobile locksmith is prepared to come to you quickly, usually within 30 minutes or less, get your car door open, and retrieve your keys or even make you a duplicate set on the spot, leaving you with no damage to your vehicle and charging a competitive and often very affordable rate for these services. Another benefit to using a professional locksmith when your keys are locked in your car is that they are trained and handle these lockout scenarios every day. TIP: Calling a locksmith is often the best place to start to save you time, needless effort, and a whole lot of money, not to mention repair bills for damage that DIY attempts often leave. Stay calm, and relax. Because, when you go straight to best solution, you will be back inside your car, with car keys in hand, and being locked out of your car with locked keys in car will not be a problem for long.